Father Edward J. Flanagan: I know that a mother can take a whip to the toughest boy in the world, and he forgets it because he knows that she loves him. Boys Town is not the actual story of the founding of the famous orphanage in Nebraska for homeless male youth. True some of the problems that Father Edward J. Flanagan had in making his dream come true are dealt with here. But about a third of the way through the story line changes and it deals with the problems of one of the youths Boys Town takes in. 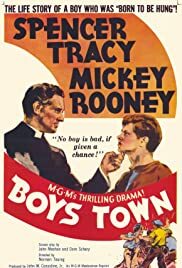 The youth is Mickey Rooney and Father Flanagan is played by Spencer Tracy. They are some contrast in acting styles. It's a tribute to Director Norman Taurog in that he was able to reign in Rooney, who's performance some times goes a little over the top. Tracy however beautifully underplays against Rooney. San Francisco two years before was a milestone film for Tracy. Previous to San Francisco, Tracy had played mostly roughewn types on either side of the law. No pun intended, but as the priest there, Spencer Tracy became the wise paternal figure so beloved in so many films. There's a lot of Father Tim Mullin continued on in Tracy's Father Flanagan. No new ground was broken, but the ground was carefully cultivated by Tracy in Boys Town, earning him a second Oscar in a row. That Oscar resides at Girls and Boys Town today, the place did go co-ed in the Seventies. Tracy was under a lot of pressure in this part because Father Flanagan was still alive. Rumor hath it that he enjoyed Tracy's portrayal very much. Well if my life story was ever important enough to bring to the screen, I couldn't ask for anyone better than Spencer Tracy to play me.